“This album of work is particularly meaningful to me, because of the people I worked with. I worked and recorded with the same people for the entire project, which was dope in the sense that we were able to build a continuity and flow with all the songs." 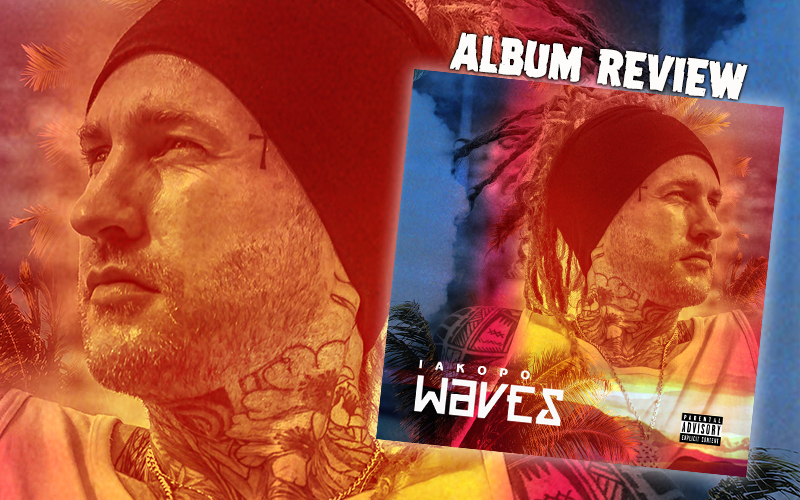 Oh yes, Iakopo's new release definitely has a flow, and that's not just because of the title Waves! As indicated in the quote above, both production and recording of the 12 songs included laid in the capable hands of Chaz Rox from Carson, California, and the abundance of sun in this corner of the world shines through every note. Until 2010, he was known as Keys of Creation and, before that, as Rein Free, releasing albums under both aliases. After living in Japan for a while, he has now found a new home in Jamaica, making it easy for him to connect with artists like Jemere Morgan who is featured on Don't Mash Up The Vibes. Blessed with an exceptional voice that seems to maneuver effortlessly through soft and smooth as well as wicked and rough waters, Iakopo manages to capture the listeners despite a few rather shallow lyrics. In combination with the pleasant rolling sounds of the riddims, which establish a distinct sonic whole by still being diverse enough to create a new listening experience with every track, the release comes at exactly the right time to ease the pressure of winter. The first single release In The Back indeed brings summer into our hearts, and in case the audio is not enough, check out the accompanying video below. The vibes thus evoked are continued in tracks like Easy, Right Now (featuring Moi) and So Nice, while Never Letting Go (presenting the gifted Yaccahmoe) and The Wave lean heavily towards modern Pop and Dance music. Bo Napoleon, another sun-kissed singer from Cali, is featured in On, a track talking about the wish to "party with my girl in a bikini top". Although that's quite understandable, it adds to the overall impression of a heavy focus on girls, smoking and having fun. One of only two pieces that expand into more serious depths is My Revolution: "They wanna keep our minds in a small box, they don’t want unity they want us all divided.” More of that! The other stand-out tune for me is Legends. Not only does it sport a catchy melody, a relaxed dubby quality and Iakopo's voice at it's best, but also well-conceived lyrics that invite you on a journey of spiritual growth. Waves is a must for keeping the cold at bay, especially if you haven't heard about this exceptional artist before. Let Iakopo rock you!